The Answer to the Knicks’ Problems? Less Practice! Are the Rangers Really an Offensive Juggernaut? 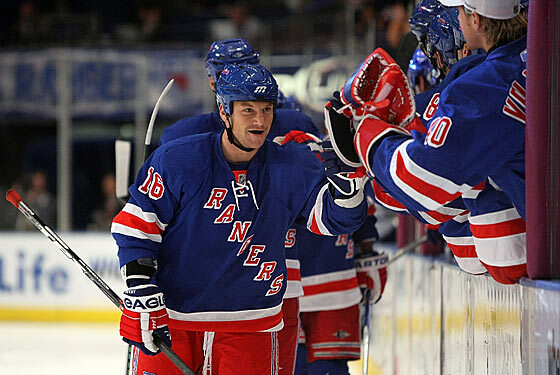 The Rangers scored seven goals last night, something they hadn't done in the regular season since April 1, 2007. As of this morning, through six games, they're tied for the league lead in goals scored, with 24. Once again, this is the Rangers, the team that finished 25th in scoring last year, then lost three of their top five goal producers. Since losing on opening night in Pittsburgh, the Rangers have won five straight and are tied with the Penguins with the most points in hockey. Before we get too ahead of ourselves, the season's not even two weeks old, and scoring seven goals against a pathetic (and still winless) Toronto team can go a long way toward padding the numbers. But their early schedule hasn't been a cakewalk: They've also got wins against New Jersey and Washington. Instead, it appears that John Tortorella's mad system of speed and risk-taking is paying off. It's not just about hustle and forechecking, either: They appear to be better conditioned this year, and have outscored opponents 12-3 in the third period. Over the last few years, the Rangers made it look awfully difficult to score goals. It always felt like they'd need to execute the perfect play to score, and that doesn't happen often. And it's a wonder they ever scored with the man advantage, since their entire power play appeared to consist of passing the puck along the boards and occasionally taking a shot that would invariably be blocked. This year, everything looks more effortless. Quicker decisions have led to crisper passing plays, shots are getting through from the point, and there's a general effort to get the puck toward the net, even from funky angles. Again, it's worth remembering that they started the season 10-2-1 last season, and barely made the playoffs. And two weeks into last season, it appeared that the line of Brandon Dubinsky, Aaron Voros, and Nikolai Zherdev would collectively win the Hart Trophy. So maybe it's too early to tell anything. But still: Five out of six ain't bad.